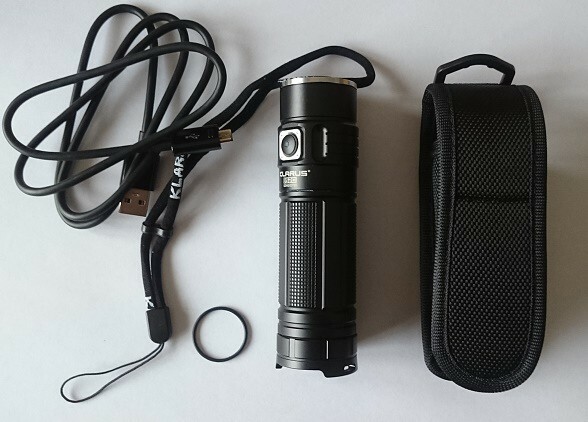 In the retail box of Klarus G20, in addition to the flashlight itself, there is a 26650 battery (charged at half capacity), recharging cable (a standard USB - micro USB cable), wrist loop, a nylon belt holster, a spare O-ring and a manual. As with all of the Klarus flashlights I have seen, the construction feels solid and of high quality. The belt holster is not as solid, however: the pouch itself seems solid enough, but the belt loops are not as sturdy. 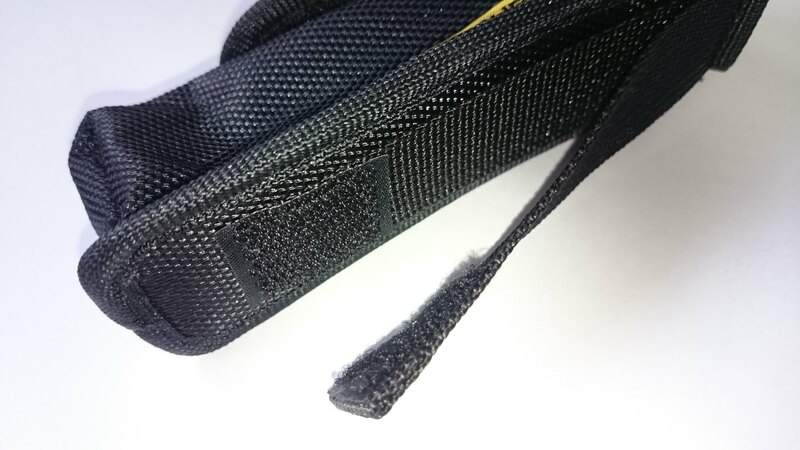 The holster has double belt loops, the other being solid so that you need to remove the belt (and if you have other items in the belt, you might have to remove them) before sliding the flashlight holster in place, and the other belt loop is olen from other end, attached with velcro. The velcro patch is very small, about the same size as my thumbnail, so it´s clear it won´t keep together if you for example happen to sit in a chair with armrest, and the flashlight hits the armrest on your was down. The solid loop is better, but it could also be sturdier. The holster has also a solid D-loop that you can use to attach the pouch with a carabiner, hanging from a packpack, for example. You can also use the D-loop to attach the pouch to a belt, using a flextie or something like that. 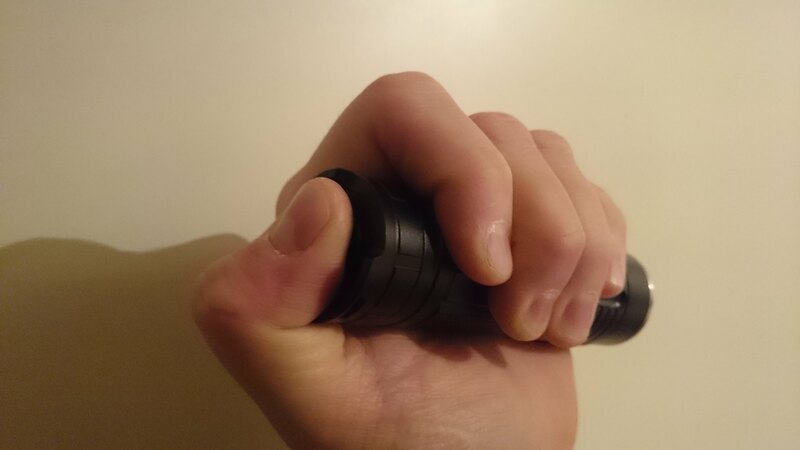 The flashlight is about the same length as regular tactical flashlights, but it´s significantly thicker. It is not soda can size, as many miniature searhligts, making it more comfortable to carry the flashlight on a belt. 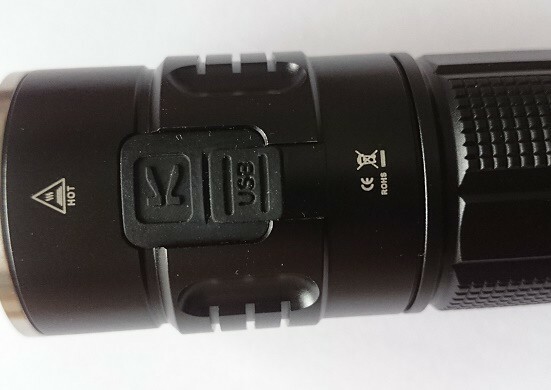 The flashlight is evenly thick from bezel to the end cap, and directly after the bezel, there is a micro USB charging socket, covered with a rubber plug. On the opposite side is a light switch that doubles as a charging indicator. In the middle of the body, there is a smallish checkering and deeper, parallel grooves to improve the grip. The other light switch is located in the end cap and is partially covered with a protective ring, that has attaching points for the wrist loop. The protective ring makes is possible to tail stand the flashlight. Both of the light switches are rather small. The light switch located in the body, doubles as a charging indicator. 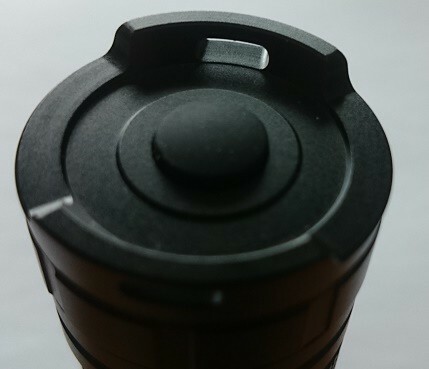 The switch at the end of the flashlight is a traditional rubber (or silicone?) switch, that has a diameter of about one third of the diameter of the flashlight body. Both of the light switches are reverse clilcky type. Because of this, the flashlight does not have a real momentary of function - there is a kind of deleyed momentary on; I´ll get to that a but later. Using the tailcap switch, the flashlight lights up on the dimmest light setting, and with every concecutive click, the light goes up one level, and from turbo to dimmest setting. You turn the light off by keeping the light switch depressed for one second. The switch located in the body functions otherwise the same way, but it has a memory, activating the light on the same level that was last used. When the light is off, and either of the light switches is depressed for one second, the light activates on turbo, and the light goes off when the switch is released - this is the delayed momentary on I mentioned earlier. If either of the light switches is rapidly clicked twice, the flashlight goes to strobe mode, and with another double click is goes into SOS beacon. The light switches can be locked out to prevent accidental activation by keeping both of the light switches depressed for two seconds. 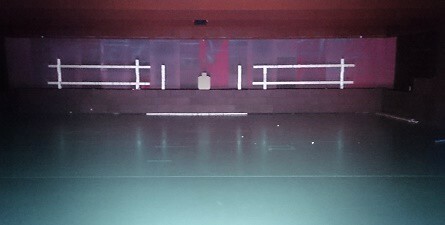 The light beam is very wide and even, and is has a wide hot spot. Measured from a distance of one meter, the hot spot has a diameter of 0,4 meters, and the whole light beam is about 2,2 meters wide. The diameter of the whole light beam was a bit hard to measure, though, as the light beam bounced from walls and ceiling and lit up the whole room I used in measuring the light beam, making it a bit hard to determine the point where the light beam ended. The light beam has a very modest throw: measured per industry standards, it is some 150 meters, but that determines the distance where the light beam produces 0,25 lux of light which translates approximately the amount of light you get from a moonlight on a cloudless night. In my opinion, that is not a practical level of lighting (especially considering that you look through the light beam of the flashlight, which means that your vision is accustomed to brighter levels of lighting). The practical lighting distance is only a fraction of what the industry standard makes you think, being at about 40-50 meters. 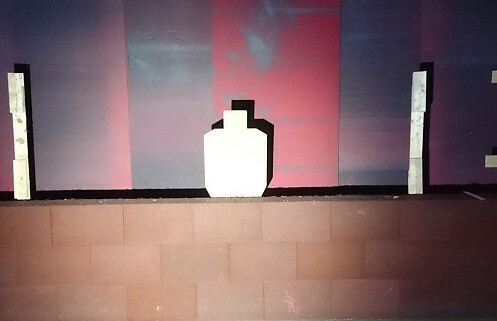 In fact, even at 25 meters in the indoor shooting range I used to take some pictures, you can clearly see that although the flashlight lit up the area quite well, the light beam is dispersed and not as intense as with flashlights with narrower but not as bright light beams. In addition to that, although at short distances the light is very bright and probably "enough" for most purposes, it has been reported that the actual lumens are closer to 2000 than the advertized 3000 lumens. I don´t have a means to measure the light intensity, but in practical use the actual lumens don´t matter, rather the the main thing is, how well I can see the surroundings using the flashlight. 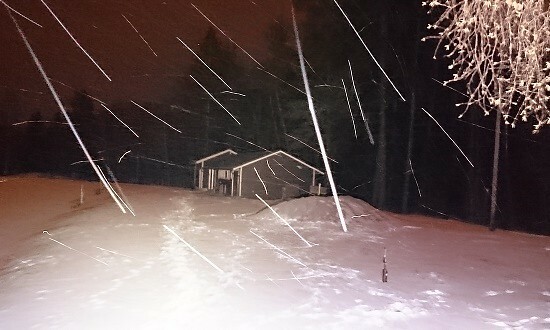 And at close distances, this flashlight fares well. 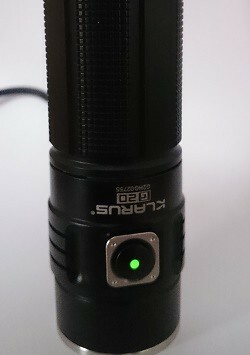 The flashlight fits well in my hand apart from that tailcap switch was a bit hard to reach with my thumb. Although my fingers are not short, because of the diameter of the flashlight and the small size of the tailcap switch, I found it somewhat difficult to properly reach the light switch. It was not overly difficult, but for someone with short thumbs, this could prove a problem. It would probably help a great deal if the light switch was larger in diameter. The light switch in the body worked otherwise well, but it has the same problem with side switches in general: you might have to search for the button, depending on how the flashlight is resting in your hand in relation to your fingers. The side switch has a small LED that indicates the battery status when the light is turned on: Green light means that the battery is 100-70% full, range is 30-70%, red less than 30% and blinking red is less than 10% of full charge. The same LED is used to indicate charging in progress, and when the charging is completed. For charging, there is the micro USB port in the front of the body. Attaching the charging cable is a bit hard, as the charging port somewhat tight, and it is located deep inside the flashlight body. It is worth noting that the battery drains empty quite fast, therefore you cannot store the flashlight unused on a shelf for prolonged periods, as the battery will probably be empty when you need the flashlight. I had left the flashlight unused for about two weeks with almost full battery. When I used the flashlight the next time, the charge had dropped to less than 30%. In fact, the battery was so drained that the flashlight would not light up in turbo mode. If the flashlight is used (and charged) regularily, this is not so big an issue, but if it is used only occasionally, there is a big risk that the battery is drained empty when you need the flashlight the most. 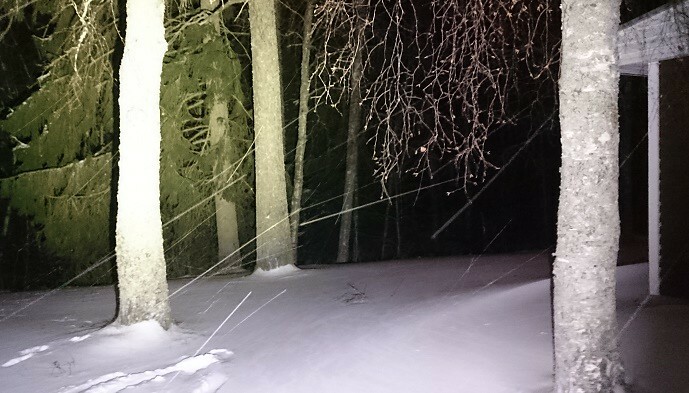 Although the flashlight seems to be high quality and there is plenty of light output at close distances, the short throw range limits the potential uses for the flashlight. On the other hand, if you need plenty of light at close distances, like when lighting up a room - and you charge the flashlight regularly - this might be just what the doctor ordered. 3000 lumens (or bit over 2000) might be even too much at close distances, but then you don´t have to use the full light output. Therefore it is good that the flashlight turns on at low light output as a default, but on the other hand, you can turn the light on directly at turbo mode, also. I think that the best feature with the G20 is that unlike many miniature searchlights, it is not overly thick, making it realistic to carry it on your belt for prolonged times. For the most part, the technical data is provided by the manufacturer. 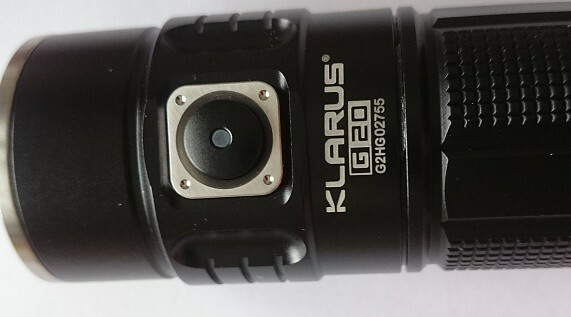 The flashlight was provided by Klarus for review purposes. Thanks for another great review. I found the same issue with parasitic drain on mine, too. Mine will empty a 26650 in less than a month. They need anodized threads to allow mechanical lockout otherwise you have to remove the cell when not being used. Mine also was over rated in output as mine only tested at around 2250, a fair bit lower than the claimed 3000. Good review with details explanation. Like this. I am thinking to buy this.